918s are like London buses - you wait ages for one, then three come along at once. 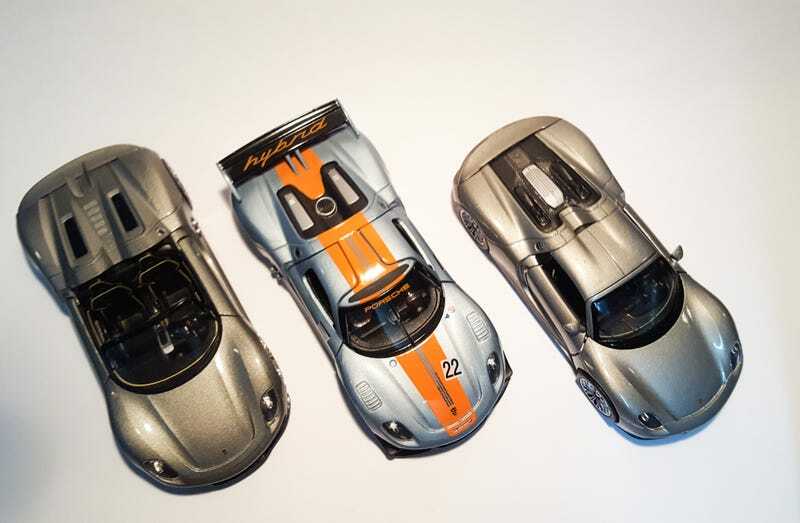 As much as I wish they were real, today’s piece showcases Welly’s 1:36/38 adaptations of the Porsche 918 across three different ideations. First unveiled on the eve of the 2010 Geneva Motor Show, Porsche’s first plug-in hybrid electric car left the world in awe. Combining a sleek exterior with a V8 and two electric motors, it was planned to have upwards of 700 bhp but at the same time be efficient enough to return 3L/100km (78 MPG). Make no mistake, Porsche’s end goal was to make a ‘sports car for the 21st century’ and best the Carrera GT. On to the model. Now, this scale is more suited to be a toy rather than pure collectors’ items. Priced at ~MYR30 (~$5), cars of this scale usually possess less detail than 1:43s or even high-end 1:64s. It’s a reason why I used to have reservations about displaying them. But hey, if it’s good enough for Porsche to licence, it’s good enough for me! I would say the details are adequate. There’s enough colour on the panels and seats to make it seem less like a toy. It helps too that the car is convertible - the green piping catches your eye when peering into the interior. The seats also have great detail. They look very similar to the real thing and the tiny tampo-printed 918 Spyder script on the headrest is well affixed, straight and smudge free! While we’re on the topic of scripts, let’s take a look at the model’s rear fascia. Present and correct in quintessential Porsche font, the 918 Spyder badge is very nicely replicated. The green pops in the right light and most importantly, it’s clear to read. This has to be one of my favourite angles of this model. The way the light rains upon the smooth panels and the car’s imposing profile is just something to behold. I love how crisp the exhaust details are; the gunmetal shade and its protrusion gives the car a striking appearance. Of course, there are some minor complaints about the model - the glaringly obvious would be the lack of side mirrors. However, it’s something I can overlook - given the complexity of the original design and its (presumed) fragility in toy form. As far as functions go, the most this car has are doors that open and a pullback motor - all features shared with the other two models below. My favourite detail of this particular model has to be the rear wing - the butterfly-esque detail is impressive! A year later, the madmen over at Porsche came up with this - the 918 RSR. Being a more developed, race-ready version of the Concept unveiled last year, the RSR came equipped with a 563 bhp V8 mated to two electric motors - which bumped peak power to 757 bhp. Power comes through this weird looking thing next to the driver called the flywheel accumulator. It’s an electric motor capable of spinning up to 36,000 rpm and works akin to the KERS system found on F1 cars up till a few years ago. On the Welly, the accumulator is well-represented. There’s enough wiring details and piping that stand out once the reds and blacks were added by me. On the outside, the ‘liquid metal chrome’ colour is actually pretty nicely done. It glows and has a shimmering effect to it under proper lighting. Once again, the tampos are crisp and perfectly proportioned - from the Porsche Intelligent Performance words to the alignment of stripes, it’s a good showing from Welly. That’s some great tampo work for what is essentially a cheap toy! The exhaust detail is just as good as it is on the Concept Study too. Nonetheless, my favourite detail on this car has to be the spoiler! I love how the complex, two piece structure with trick wing end-plates are portrayed on this model. To be honest, I haven’t seen other manufacturers producing a similarly sized RSR, so this makes it an automatic winner for me! Of course, it’s not without it’s flaws. The panel gaps are a little too large, the interior is slightly under detailed and of course, the car could be helped with some form of rear view cameras, but these are all minor gripes. Produced in 2013, the production version of the 918 thankfully didn’t stray far from the concepts. It was largely similar to the concepts, if only with the added cachet of an additional 5 years of developments. The production 918 crafted crazier numbers - the V8 powerplant now provided 608 bhp and the twin electric motors spinning up 279 bhp. All in, it’s an 887 bhp hybrid hypercar capable of dispatching the century run in 2.2 seconds. I think I am not alone with the opinion that Welly hit it out of the park with this one. This car’s gorgeous - clean, unfussy lines that match perfectly with curvy wheelarches. I can’t stop looking at it - everything is moulded beautifully and what’s on the real car is present here. And that includes the side mirrors! Details are aplenty on this car. Like previous models, there’s enough detail here to make this a collector’s piece. The badge details are top notch (check out the tiny e-hybrid script) and if you’d notice, the wheels are very similar to the Concept’s, but feature subtle differences to set it apart. Just like the real thing. Another angle I love. One thing about this model that stands out is that it’s not fitted with the Weissach package that adorn so many other 918 models. I’m not sure which I’ll like more in real life, but I’m quite sure I appreciate the clean look here! Naturally I have to discuss my favourite part of the car and this is undoubtedly it. The engine cover. The bonnet is absolutely massive and in real life, it’s meshed - a bit of a tease about what’s lurking below. Welly did a great a job on this piece in replicating the mesh design - it looks perforated but it actually isn’t! There’s also some detail that you can spot under the cover and that’s a welcome bonus. The final verdict - pick your poison! This post never meant to be a comparison about which one is better and which should you go for - hell it’s cheap enough to actually have multiple copies of one model. It’s to show you how sometimes even relatively cheap models can be great showpieces of your collection. Let me know which one you love the most in the comments below! I hope this has been a joy for you to read as it has been for me in writing it and till we meet again, Viva La LaLD! Woah woah woah, is this Porsche week?? Hey LaLD, how do I fix this?